As of last Thursday (February 28th), The MP63 Fund (DRIPX) turned 20 years old. • Maintaining a low annual portfolio turnover—as of the last quarterly report: 2.48%. Managed by Moneypaper Advisors--Leveling the field for investors since 1980. 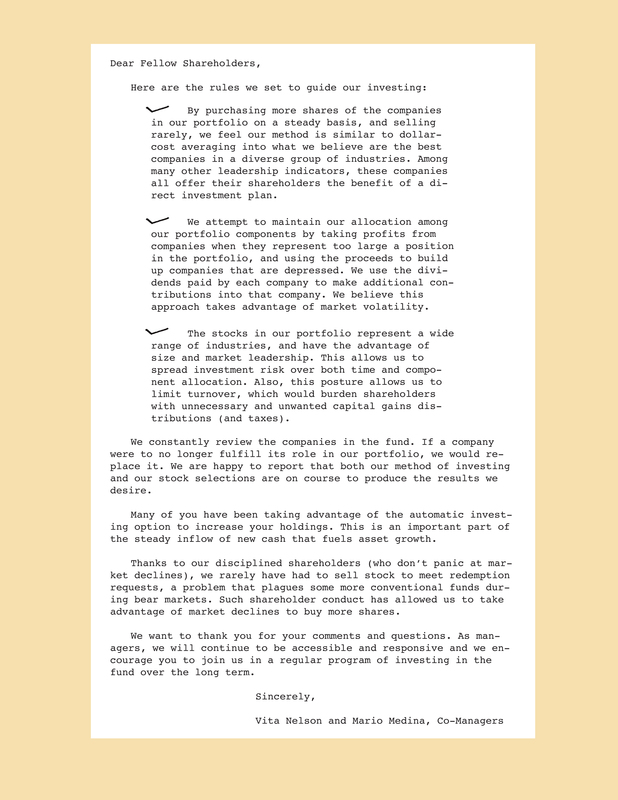 Starting in 1984, Moneypaper, a monthly financial newsletter, touted the advantages of investing through company-sponsored dividend reinvestment plans (DRIPs)—a largely unknown opportunity until then. In 1994, the Moneypaper editors established an Index to compare the performance of companies with DRIPs with the market as a whole. In 1999, to assist subscribers who wanted to invest in DRIP companies for their IRAs, Moneypaper editors organized the MP 63 mutual fund (DRIPX), which was based on those companies that they had been following since 1994. Please read the MP 63 Fund prospectus before you invest or send money. If you have any questions, please call shareholder services toll-free at 1-877-MP63FUN (1-877-676-3386) or Vita Nelson or Mario Medina 800-388-9993. The MP 63 Fund is offered only to United States residents, and information on this site is intended only for such persons. Nothing on this Website should be considered a solicitation to buy or an offer to sell shares of the Fund in any jurisdiction where the offer or solicitation would be unlawful under the securities laws of such jurisdiction.